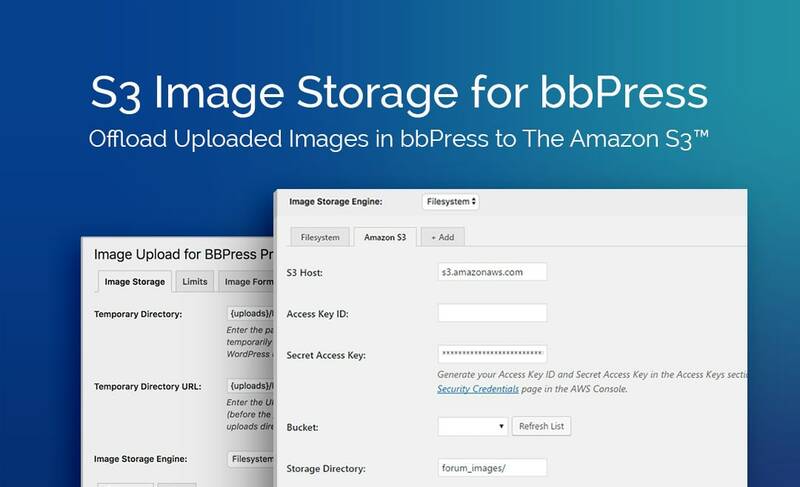 Helping bbPress forums better manage their storage space and bandwidth usage, the S3 Image Storage for bbPress Add-On works in conjunction with the Image Upload for BBPress Pro WordPress plugin to offer image storage options through Amazon Simple Storage Service (S3)™. With S3 Image Storage for bbPress, bbPress administrators can save storage space on their own servers by storing images uploaded to forum posts in Amazon S3™ buckets. With this setup, Amazon S3™ will serve the images in the respective posts, decreasing the load on the server and assisting in website performance. As an extension to Image Upload for bbPress Pro, S3 Image Storage for bbPress is not a standalone plugin but rather works in conjunction with the Image Upload for BBPress Pro WordPress plugin. After installation and activation, the S3 Image Storage for bbPress Add-On will create a new tab and dropdown item within the Image Storage tab of the Image Upload for bbPress Pro plugin. In the Amazon S3™ tab, located within the Image Storage tab of Image Upload for bbPress Pro, the user is able to enter details relating to their Amazon S3™ account. This will allow S3 Image Storage for bbPress to communicate with the Amazon S3™ account from the WordPress website. Also in the Amazon S3™ tab, the user can set the S3 bucket and storage directory for image storage. Once the S3 add-on is configured in the Amazon S3™ tab, the user must activate the add-on. To do so, Amazon S3™ must be selected from the Image Storage Engine dropdown in the Image Storage tab. Once complete, the S3 add-on is ready for use. Please note: The screenshot is from version 1.0.3 of S3 Image Storage for bbPress. For the latest feature list update of version 1.0.1 please refer to this blog post.